Note: Please scroll down to see more about the dolls and their stories below. Click on smaller images to see details. Please contact me if you are interested in purchasing a doll. Flip Doll Images coming-these are my most recent dolls. Please see Blog page for more information about them. This pair of dolls, created this year, were an experimentation with combined needle felting and wet felting. They explore the idea that aging doesn't have to slow us down. We can dance at any age. 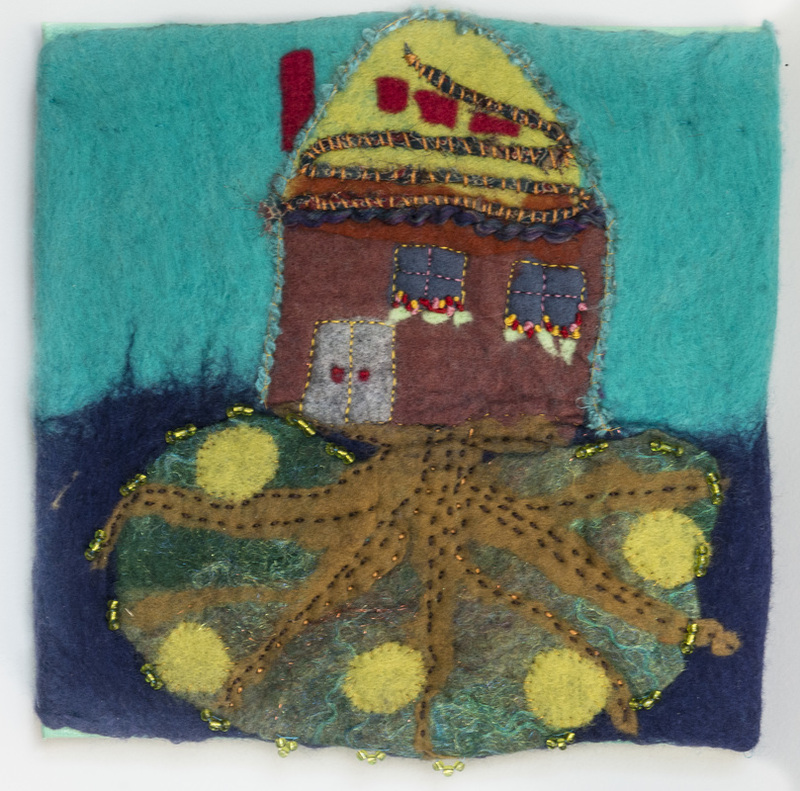 They were inspired by my mother, whose name is Ursula, turning 80 this year. 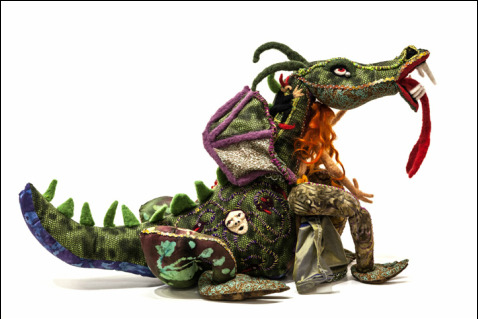 below are some of the dolls that were exhibited in the Materialized Magic: Mythical Creatures in a Yarn Bomb Habitat show June-August 2016, Arlington Arts Center and Torpedo Factory, for more information, see workshops page. For more about Tumnus, see below on this page. "Miranda/Pegasus" side of the large flip doll, needle felted and mixed media, 4' 2"
"Barbie/Anita Bryant" side of the big flip doll, needle felted and mixed media, 4' 2"
detail (back) of the "Barbie" side of the big flip doll, "Barbie trying to climb out of the back"
"Miranda/Pegasus" side of the small flip doll, needle felted and mixed media, 18" x 18" x 8 "
Series of three dolls, each with two sides. “Flip” or “topsy turvy” dolls are double-ended dolls, typically featuring two opposing characters. 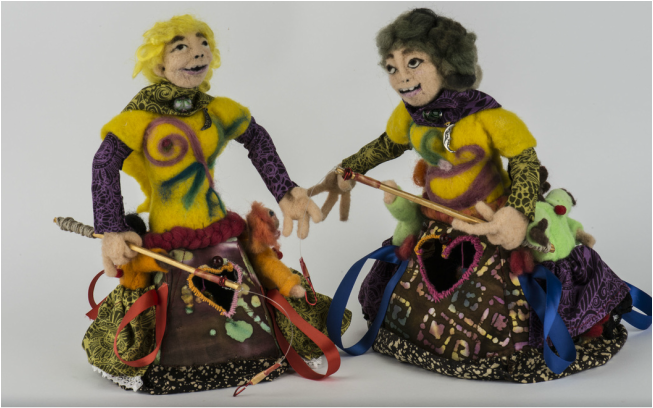 The dolls shown here were part of a collaboration between Torpedo Factory Associate artists, Erika Cleveland and Susan Sherwin. 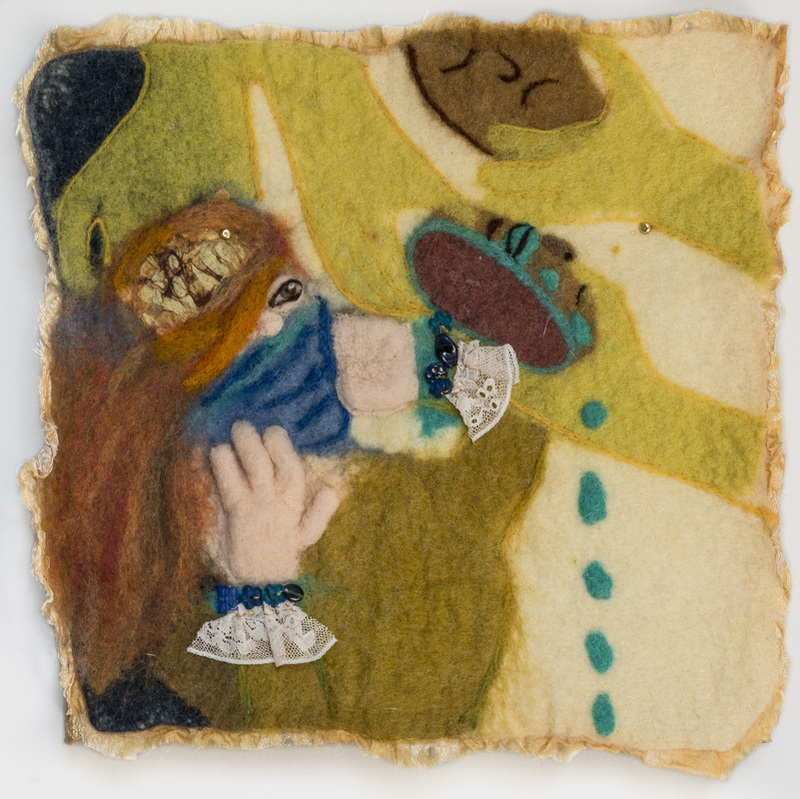 Cleveland’s two sculptural needle felted dolls alternate between a floating-on-a-cloud angelic woman with a white winged horse, representing freedom and spaciousness. This doll sits on a trapeze-like structure which when flipped, alternates to the “alter ego” character of a Barbie being nagged by (in the smaller version of the doll) or (in the larger 50” version,) being swallowed up by an Anita Bryant mouth. Sherwin’s flip doll has, on one side, “Mrs. Fezziwig,” a boisterous, life of the party character from Charles Dickens, “A Christmas Carol.” Her doll flips to another side featuring “Neko,” a Japanese geisha cat, stylish, quiet and intuitive, another side of the artistic personality. 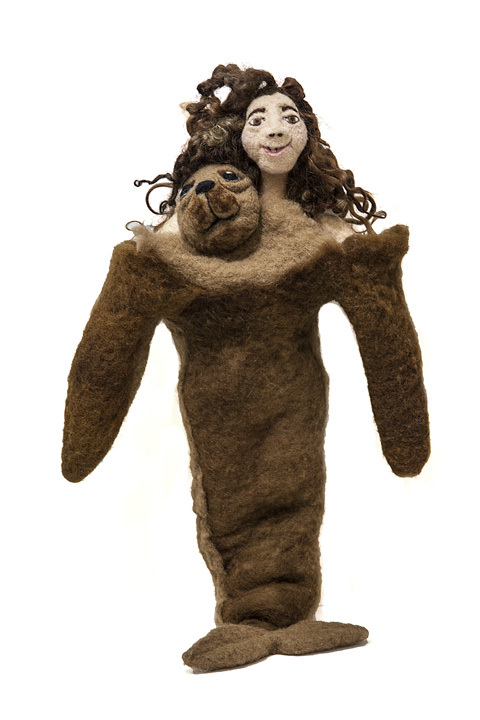 "Tumnus but not a Faun" is the final version of the healer doll, that took two years to make! 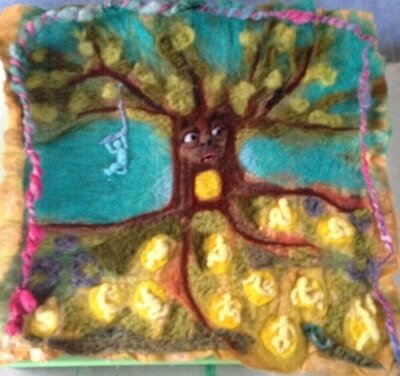 He is needle felted with lots of other techniques integrated as well. 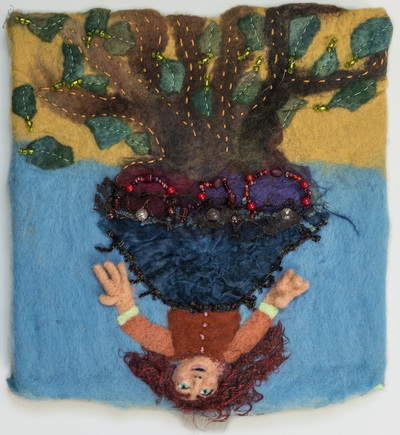 His cape has wet felted images that tell the story of a place where nuns collect tears that are purified in the pools that run along the edges of his cloak and on the other side of the cloak is an image of people coming to receive healing from the purified tears. On his back is an image of Rhea, shedding the old. 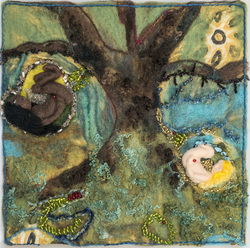 On his belly are two versions of the tree of life. It has twelve balls of light, one on the tree and one in the roots. These dolls were created in 2013-15 for specific healing purposes. See below for more detail about their individual stories. Gypsy Polly has a kind of interesting story. I started to make her as part of a soft sculpture doll class I was taking with Pamela Hastings, a wonderful doll-maker and teacher. 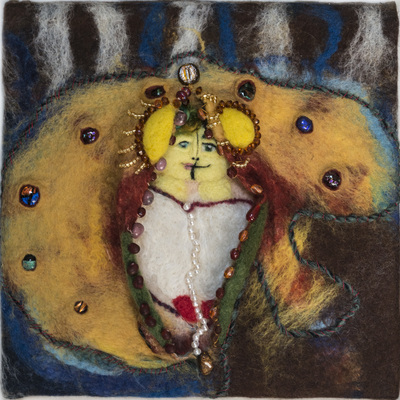 Polly doll combines a number of influences. I have been fascinated recently with the many armed gods and goddesses in the Indian pantheon. To me the many arms represent the richness of life, all the ways we reach out and grab at life, so I knew I wanted her to have many arms. She has six. At first I wanted this doll's face to be beautiful but the more I worked on her, the less she looked like the idealized beauty that I had imagined. 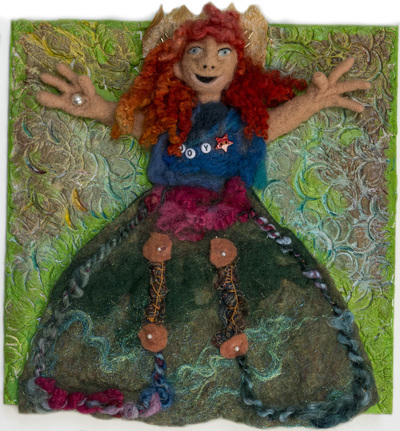 Many tears were shed in the creation of this doll with the intense emotions that she evoked. It wasn't until I embraced her appearance and let her look the way she wanted to, that she became the gypsy wise woman that you see here. I honored her strength and her regal qualities with golden arms, richly patterned fabrics and beautiful earrings. Her wild red hair speaks to her wild spirit. My fascination with the wild Indian goddesses with their many arms, includes Lackshmi, the goddess of wealth and charisma. She holds coins in one hand to represent infinite wealth, a conch in another hand to symbolize communication and a lotus in another hand for peace and stillness. Her front two hands are held together in prayer. 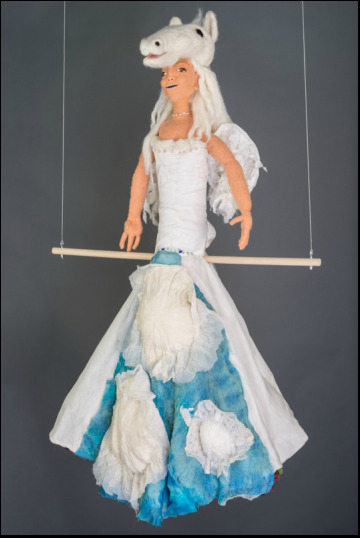 But this doll also represents my fascination and continued exploration through doll-making of the image from the Christian tradition of Mary Miseracordia, who holds all her followers in the folds of the skirt beneath her. Here Lackshmi (echoing this aspect of Mary), holds a representation of the male God Shiva under her skirt. I see the male God also as the male side that all women contain within them, their strength, power and wisdom. Gaia and Ernst came from a similar inspiration to Lackshmi. Gaia or earth mother, holds Ernst, a male spirit under her skirt. He represents her people. They both contain innocence and wisdom. These dolls started, as many of my dolls do, as an image of the ways in which mothers and daughters relate to each other. I saw the mother and daughter, each holding a fishing rod and each fishing from within the other's open heart area. Somehow in this version of the dolls, the opening is lower down, more in the area of the womb. To be honest, the original idea was more about the challenging nature of the mother daughter relationship. But once the dolls were in front of me, as so often happens, I saw something else there. I saw the openness that can exist as part of a healthy mother daughter relationship. Each is open to the other. Each is inspired by what she sees in the other. Each allows herself to be open enough to allow the other to receive what she has within. The mini dolls surrounding each doll represent the richness of their individuality, all the aspects of the self. This doll, all sculptural needle felted, is the first created at the Torpedo Factory. He is a satyr, a mythical creature who shows up in various cultures, representing that mischievous side of our nature, the side of our nature that tests things, is provocative and at times even dangerous. In other words, he isn't always seen as a positive force. I choose, though, to see him as a challenger, someone who upsets the status quo, who is gives you a push to go beyond your comfort level. The purple, green and red lines and arrows on his body represent the different energies of the body, some would call them chakras. The purple energy coming out of his head represents the crown energy, this highest spiritual energy and also the third eye energy having to do with intuition and inner wisdom and the throat energy having to do with expression. The red lines come up from the root and extend down through the feet into the ground. They connect also to the heart where they branch out into the green heart energy. This represents the open and unconditional love of the heart. Overall, he gives the message that our power comes from within. 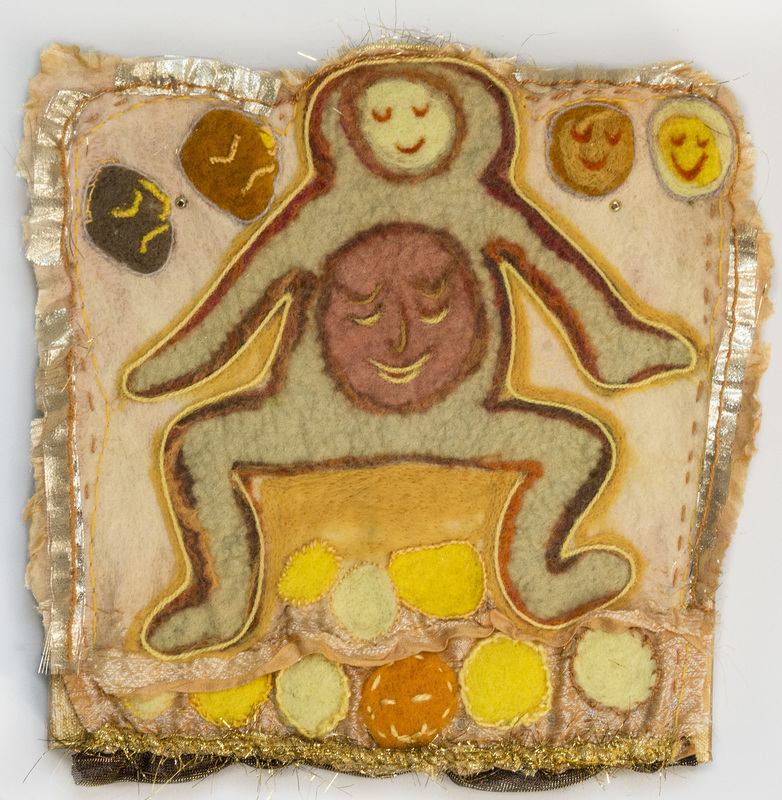 In this paper doll version of the mother and daughter dolls, the openings in each doll are at the level of the heart. The daughter is to the left and the mother is to the right. A crystal hangs within each of their hearts, representing the preciousness of what each has to share. Gurudevi is a guide. She contains elements of sky and earth in one. Her bird head (sky) and snake symbols (earth) are united by the chakras that run up her spine. 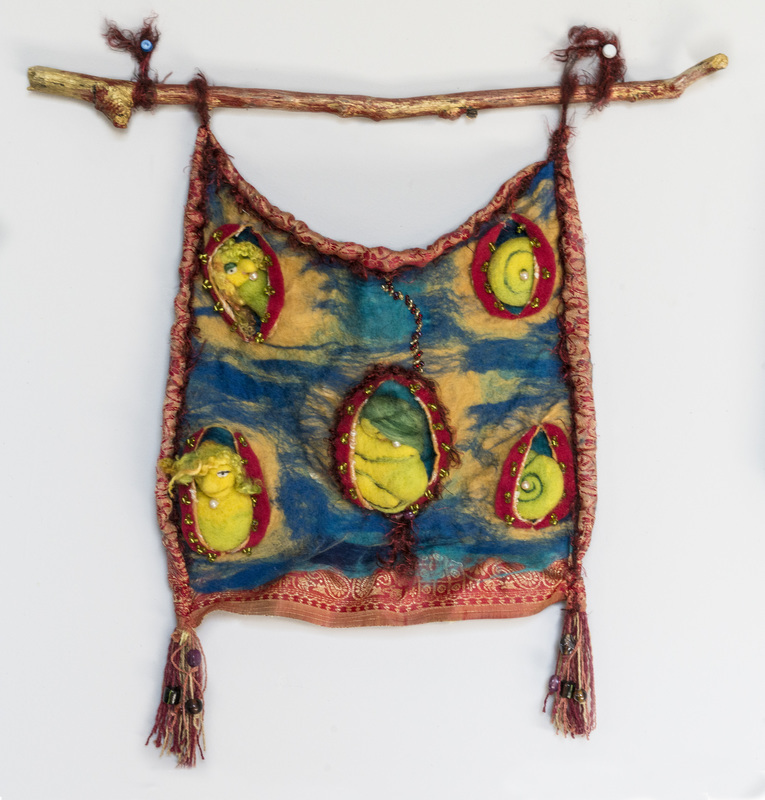 The crystals that hang below the bird head, dangle above the wearer who attaches her by the straps over the shoulders. The crystals symbolize clarity and light. 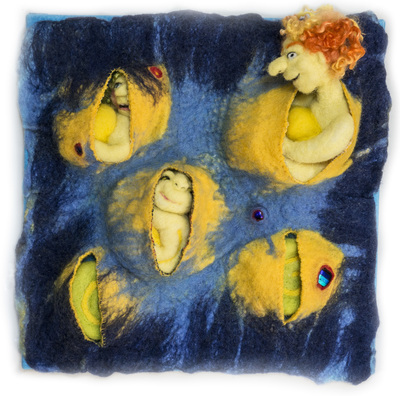 This soft sculpture dragon doll with a sculptural needle felted figure attached is about the struggle to manage inner and outer demons. The figure in front has found the courage to tame her inner dragon, so that she is now an ally rather than a source of fear. Details on the side of the dragon, under the two wings and on the neck depict the scary forces that had to be overcome. Under one wing is a snake studded Medusa head. The Roman goddess Medusa turns those to stone who dare to look at her directly. Under the other wing is a "trail of tears." A Native American "trickster" character climbs up the side of the dragon's neck. 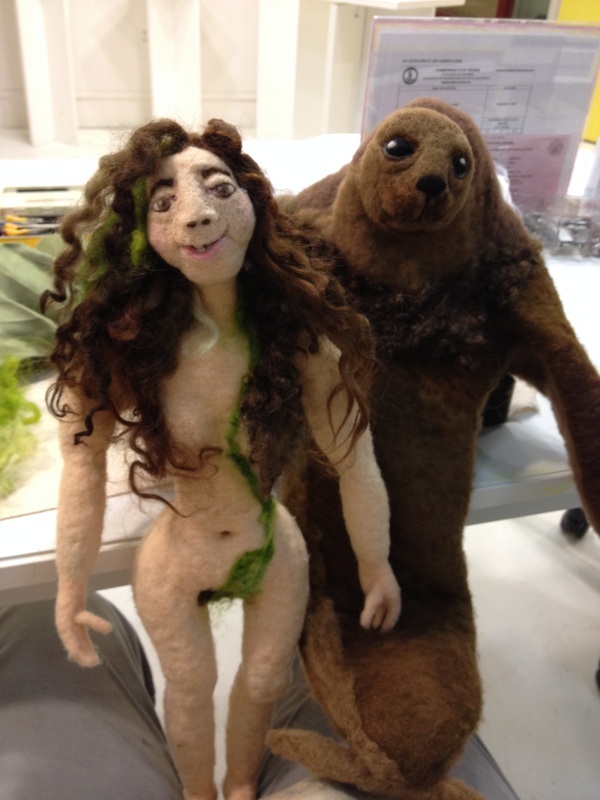 The Selkie is a Scottish "fairy," described in Scottish tales told by lonely fishermen who believed they saw seals turn into women. In the fairy tale, a fisherman induces a "selkie" to come to his home, marry him and have his children, when he hides her sealskin from her. 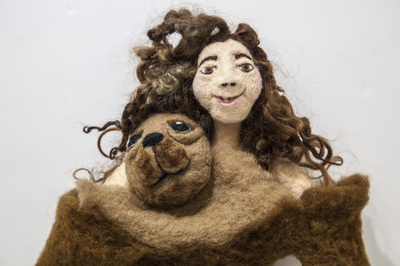 But the story always has an unhappy ending because inevitably the selkie finds the sealskin and, sliding back into it, returns forever to the sea. In my version, the selkie is about the artist's challenge/task of living both in the "real" world and the world of imagination and creativity. It makes me happy to think that I can move between both worlds.